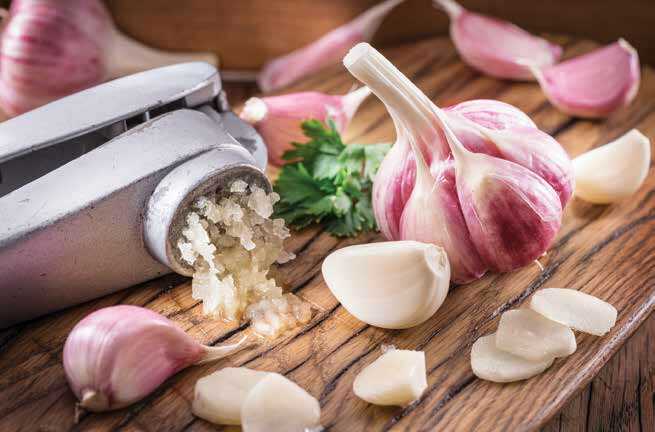 For more than 5,000 years, garlic has been used throughout the world to ward off everything from diseases to Dracula. The renowned Greek physician Hippocrates even prescribed this “stinking rose” to his patients to prolong their lives. Fast forward to the 21st century. Science now confirms much of what chefs and healers already know—garlic is one of the best foods to ward off illnesses and other medical conditions. The fact that it is also delicious, low in calories, and rich in vitamin C, vitamin B6, manganese, and other nutrients is an added bonus. Garlic produces a chemical called allicin, which is released when the bulb is sliced or crushed. Its antioxidants protect against cell damage and aging. It also kills viruses, bacteria, parasites, fungi, and more. Since garlic is a food, it causes far fewer side effects than drugs. It is most potent when eaten raw but can still provide benefits when cooked in a delicious sauce or soup. One of its most noticeable side effects is malodorous breath. It can also increase bleeding, so it should not be consumed in the days before or following surgery. When using garlic supplements, be sure to consult your doctor regarding any possible contraindications. And mangia in good health! !